Bigland: A new ad slogan is coming. LOS ANGELES -- Chrysler Group has been increasing sales and market share faster than most carmakers this year even though it lacks a competitive compact sedan. That omission will be filled next year with the arrival of a Dodge compact sedan built on the Alfa Romeo Giulietta platform, says Reid Bigland, CEO of Dodge brand and Chrysler's lead U.S. sales executive. In an interview at Los Angeles Auto Show, Bigland also said Dodge is de-emphasizing its "Never Neutral" advertising slogan in favor of ads that emphasize product features and benefits. "We've really been playing with one arm tied behind our back because we've been out of 15 percent of the market," Bigland said. "When the compact car hits the streets, we'll finally be back in the game playing with 100 percent of the new-vehicle sales market." Through October, Chrysler Group's U.S. sales rose 24 percent, compared with a 10 percent gain for the entire industry. Bigland declined to provide details about the new Dodge. 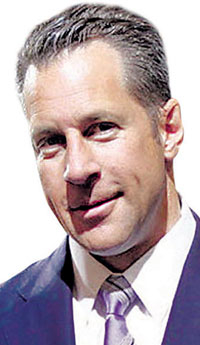 Bigland, who took over his jobs as Dodge CEO and head of U.S. sales for all Chrysler brands in June, simplified the option packages that Dodge offers and launched entry-level value packages on several vehicles, including the Dodge Grand Caravan and Journey and Chrysler Town & Country. Bigland said the Journey has "a lot of unrealized sales potential in the U.S. market. If you look at Journey in Canada, it's the 12th-highest vehicle in the country and the No. 1 selling crossover by far." The "Never Neutral" ad slogan was developed before Bigland came to the job. He said Dodge is "phasing away" from the slogan, which debuted with a controversial Dodge Charger commercial during the 2010 Super Bowl that featured resentful-looking men reluctantly agreeing to do tasks for their wives or partners in exchange for permission to drive their muscular Chargers. Bigland said the slogan is a good one, but it's time for a change. "It's not on top of my list to have another slogan," he said, but added: "Let's focus on product attributes."